Lavery, Brian (2003). The Ship of the Line Volume 1: The development of the battlefleet 1650–1850. Conway Maritime Press. ISBN 0-85177-252-8. .
McKay, John (2000). The 100-Gun Ship Victory. Anova Books Ltd. ISBN 978-1-84486-223-8. Winfield, Rif (2007). British Warships in the Age of Sail 1714–1792: Design, Construction, Careers and Fates. Seaforth Publishing. ISBN 978-1-84415-700-6. . 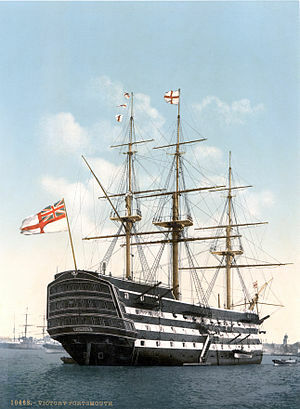 Illustrated article about HMS Victory. หน้านี้แก้ไขล่าสุดเมื่อวันที่ 2 พฤศจิกายน 2560 เวลา 03:36 น.